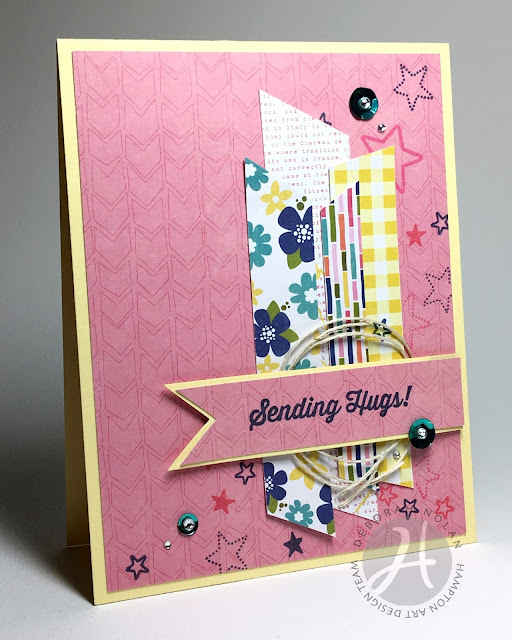 Today's card features some goodies from Jillibean Soup's Healthy Hello Soup collection! Make a 4.25” x 5.5” base from yellow cardstock. Cut PP panel, stamp stars, and adhere to card front. Cut PP scraps and adhere. Arrange cord in a circular shape and adhere. Stamp sentiment on PP and cut notch from end. Mount sentiment panel on yellow cardstock and trim to fit; adhere to card with foam dimensional tape.